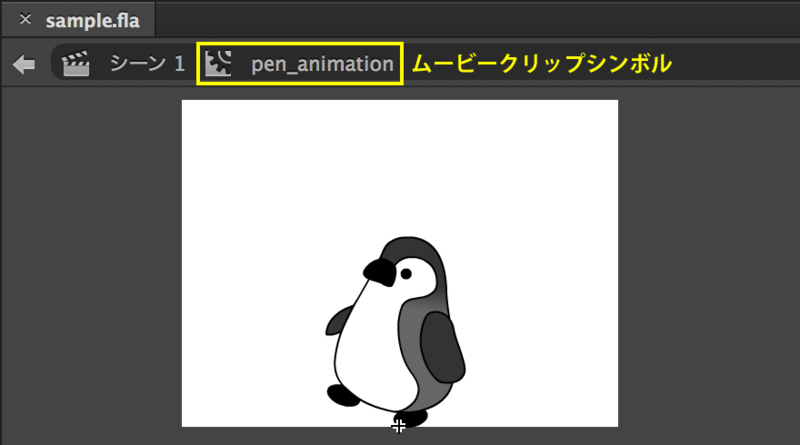 Flash Professional CC can publish MovieClip instances for CreateJS (Figure 001). Unfortunately the MovieClip class in the EaselJS 0.8.0 has no property referencing its total frames[*1]. But its number could be objained. EaselJS 0.8.1 implemented the MovieClip.duration and MovieClip.totalFrames properties to get number. This way of reference is a little hard to find out from the official document. Therefore, this note provide additional information. When publishing a FLA file, Flash Pro CC internally generates Timeline objects for each MovieClip instance and assigns them to their MovieClip.timeline properties. Timeline objects are dealed by the Tween class. Therefore, the Timeline class belongs to the TweenJS module. The Timeline.duration property represents the total duration of this timeline. However, its unit is milliseconds or ticks, depending on the useTicks parameter. In the implementation of the MovieClip class below, the MovieClip.timeline porperty is assigned a Timeline object created with true of the useTicks option. It means that the MovieClip.timeline porperty uses ticks as the unit of the Timeline.duration property. One tick makes a MovieClip object advance one frame. In conclusion, MovieClip.timeline.duration referes the number of total frames in a MovieClip object.